Head into the Distortion World with the latest Pokemon TCG expansion - SM10A, GG End! Get ready to say "GG" and End your opponent, as the latest TCG expansion pulls a Legendary Pokémon straight from the Distortion World ready to Tag Team up! Introducing SM10A, GG End! When it comes to the Distortion World, we can only be talking about Giratina! 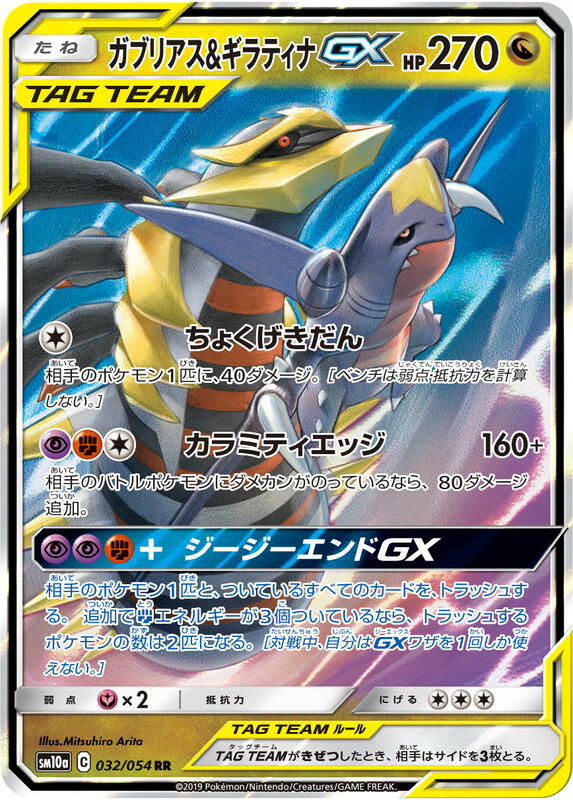 Well, you will find that when this brand-new 54+ card subset releases on April 5th, Sinnoh's mighty Giratina will be teaming up with another regional favourite - Giratina & Garchomp GX! The set is available to preorder from Plaza Japan now! Taking on its “Origin Forme”, Giratina is beautifully captured once more by Tag Team artist Mitsuhiro Arita, alongside Garchomp of course! But what are we to expect from this unlikely partnership? It's well documented by now that the GX attack of this card is indeed named after the set itself - GG End GX! A mix of Psychic and Fighting Energy means this attack won't be simple to execute, but when it does, it changes the game. Flipping the counter on GG End GX allows you to discard 1 of your opponent's Pokémon and all cards attached to it. If Giratina & Garchomp GX has at least three extra Fighting Energy attached to it, you can discard two Pokémon instead! Giratina is used to travelling to other dimensions, and it certainly takes the game to a different planet here. There are indeed more GX Pokémon to be found, including a card we're personally very excited about. When we saw the new concept of Muk & Alolan Muk from SM10, Double Blaze, we mentioned in the last blog article that it would be great to see Raichu & Alolan Raichu at some point! Well, it seems we've acquired the power of “Future Sight”! We've been waiting for an Alolan Raichu GX card since Sun and Moon began, so what's better than one Raichu? Two, of course! 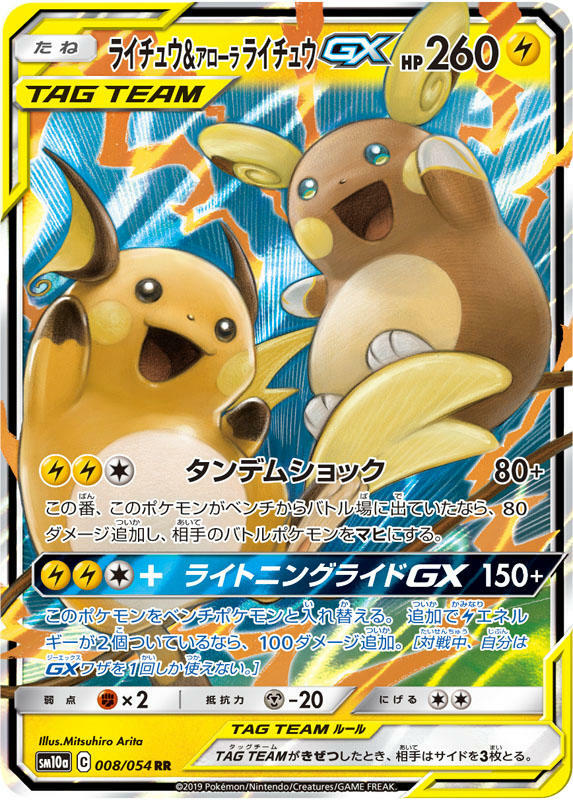 Raichu & Alolan Raichu GX do indeed tag-in to the TCG in electrifying style! Who knew?! This is a card we're particularly excited about seeing the "SR" alternate art of, along with its Full Art and Hyper Rare versions! It's Lightning Ride GX attack almost acts as a “Volt Switch”, causing 150 damage and switching out to the bench. An additional two Lightning Energy will even cause this shocking-duo to zap for 250! And whilst Pokémon are clearly listening, it would be great to see Dugtrio & Alolan Dugtrio next time! Turning to the regular GX Pokémon, it almost feels like they're playing second-fiddle to the Tag Team cards! 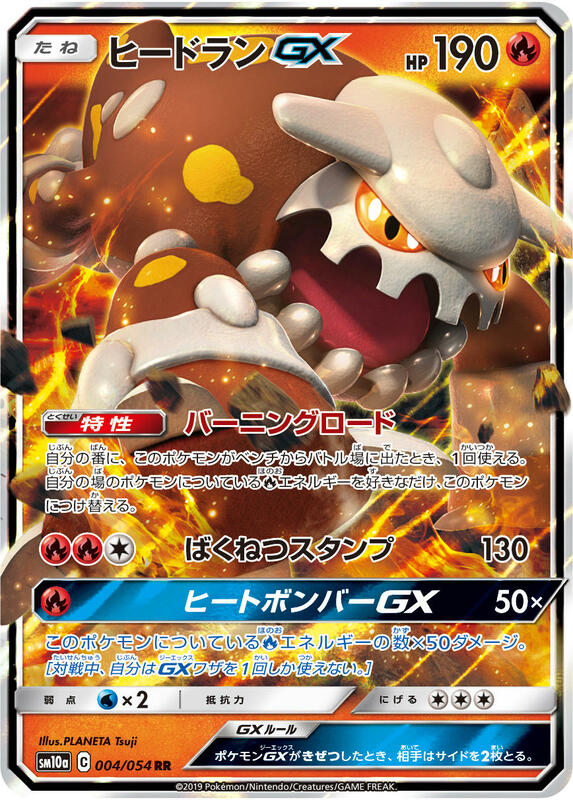 But back to the Sinnoh theme, the magma-dwelling Heatran GX hits the TCG for the first time. This Legendary Pokémon of volcanic proportions won't be playing second-fiddle to anyone! 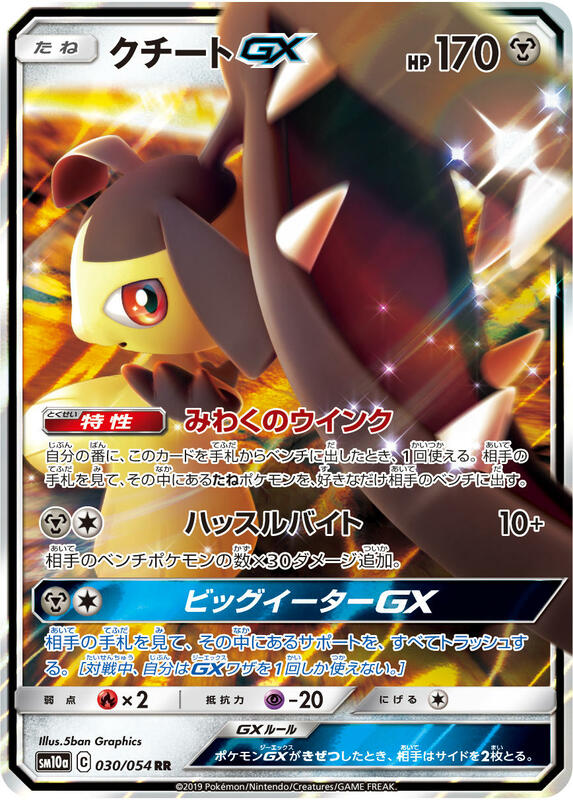 Completing the GX Pokémon this time is another favourite to some - the Steel-typed Mawile GX! Now that’s a line-up! Moving across to the Trainers and, as always, we must start with the alternate art "TR" reprints! SM10A brings us a further three TR items in the form of Escape Rope, Nest Ball and Rotom Dex . The artwork on the Rotom Dex is particularly nice - as it's depicted next to a Nintendo Switch! Switch-Rotom when?! The final TR card is the Supporter Tate & Liza, both accompanied by their signature Pokémon Solrock and Lunatone. It can't get any more Sun & Moon than that! So, what's new? There's a huge Item card introduced that some are calling the new "N"! This card is the Reset Stamp. Playing Reset Stamp causes your opponent to shuffle their entire hand into their deck and draw cards equal to their remaining Prize Cards. Your opponent will need to quickly come up with a plan B after being hit with this! Reset Stamp will see a lot play, and it perhaps the obvious choice for a golden "UR" Ultra Rare card. Tag Switch and Black Belt are the other two brand-new Items here, along with the new Stadium card Giant Stove . We can't hide our love of Full Art "SR" Supporters, and with only two included in SM10A for the first time, it's easy to predict that both Unova's Elite Four member Grimsley and Coach Trainer will get incredible SR upgrades! It's perhaps not too surprising to see Grimsley here in GG End in company with Alolan Raichu, as both are of course accomplished surfers in Alola! The artwork for Coach Trainer also has the original Tag Team duo Pikachu and Zekrom in the background, and we really hope this carries over to the Full Art! Are you ready to distort your opponent's plans and take your deck to another dimension? SM10A is bringing some seriously game-changing abilities to the TCG with the GX attack of Giratina & Garchomp GX, alongside the tactic-destroying power of Reset Stamp! Not to mention the predicted inclusion of Raichu & Alolan Raichu GX. GG End really does what it says on the box, so don't miss out and order from Plaza Japan today!